New Delhi: Remember the gleaming yellow Audi from the Delhi Auto Expo? Yes, the new R8 V10 Plus. If you thought that looked jaw-dropping, wait until you lay eyes on this one. It’s called the ‘Selection 24h’ and is a tribute to the R8 LMS GT3 that races at Le Mans. The race car has won over three hundred endurance races since 2009. The special edition will be limited to just 24 units. We know the name ‘Audi R8 V10 Plus Selection 24h’ is quite a mouthful, but hey, so are the specs. It borrows the engine from the standard V10 plus that belts out 610PS of power and 560Nm of torque. Top whack is a blistering 330km/h and 0-100 takes just 3.2 seconds. For the geeks out there, stuff like dynamic steering, adaptive magnetic dampers and laser lighting is standard on the limited edition. Visual differentiators include a three-tone paint job inspired by its track cousin. We love the subtle red accents that spice up the black and light grey combo. 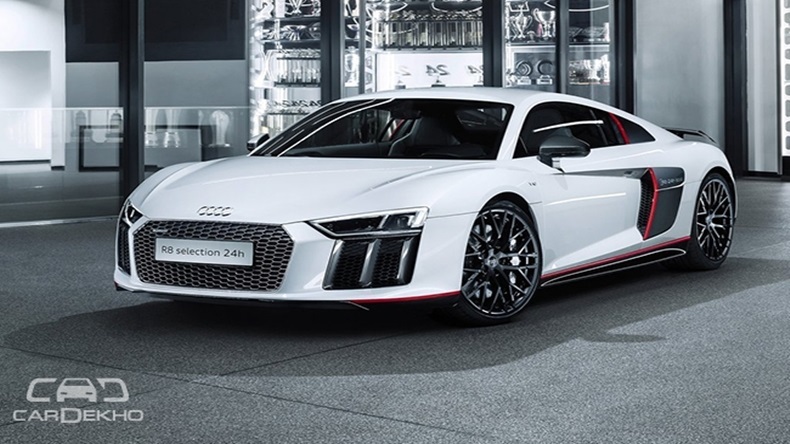 Little bits such as the 20-inch gloss black wheels, the carbon fibre side blade, rear spoiler and ‘Audi R8 24h’ stickering make it stand out. Inside, it gets full-leather upholstery, Alcantara headlining, and several carbon fibre inlays strewn around the cabin. The illuminated door sills display the serial number (1 to 24) and get a gloss carbon finish. The standard R8 V10 costs a whopping Rs 2.47 crore, ex-showroom Delhi. While we try to get our hands on one, let us know what you think of the Limited Edition. That said, chances of one finding its way to our shores is next to none.